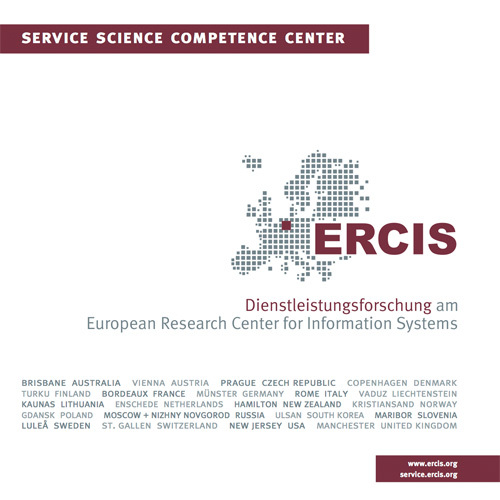 ServPay | ERCIS Competence Center "Service Science"
The research project ServPay was conducted in cooperation of the Institute for Business-to-Business Marketing and the Institute for Information Systems. The objective of the project was to develop a holistic decision support concept for successfully marketing value-added services in the capital goods industry. Pricing value bundles constitutes a complex decision problem, since it requires the consideration of three perspectives: From the provider’s point of view the available price corridor is limited downwards by the costs for engineering, marketing and delivering a value bundle. From the customers’ points of view, the upper limit of the price corridor is imposed by the expected customer value and corresponding willingness to pay. From a competitive perspective, the upper limit of the price corridor is marked by the price of a comparable competitor’s offer. On a business level, value-added services and business models were identified and systematized based on a multiple case study approach in cooperation with several industry partners. Consecutively, the identified value-added services were consolidated into a set of reference services. Also, customers' willingness to pay for value-added services was investigated in an in-depth survey, based on the ServPay Conjoint Analysis (SCPA) which was developed in the project. On an IT level, all project results were implemented in the model-based decision support tool H2-ServPay. The tool was designed to fit the needs of small and medium enterprises operating in the capital goods industry but has also been demonstrated to be valuable for software companies. Based on a core of integrated conceptual models, H2-ServPay supports the value-driven marketing and management of service portfolios. Providers of services can describe their solution space of physical goods and services with the ServPay modeling language, configure individual customer solutions, and price customer solutions based on the identified cost and willingness-to-pay data. Furthermore, reference models for the development and provision of value-added services are contained in the tool. The software prototype of H2-ServPay is available at the ServPay website free of charge. In addition, a recommender system was conceptualized that provides individualized recommendations of potentially interesting value-added services when customers express interest in a particular physical product and also leverages estimations of a customer’s willingness to pay to allow for a dynamic pricing of these services and of the incorporation of profitability considerations into the recommendation process. The ServPay project was kindly supported by the German Ministry of Education and Research (promotion sign: 02PG1010). More information is available at: http://servpay.ercis.org/.